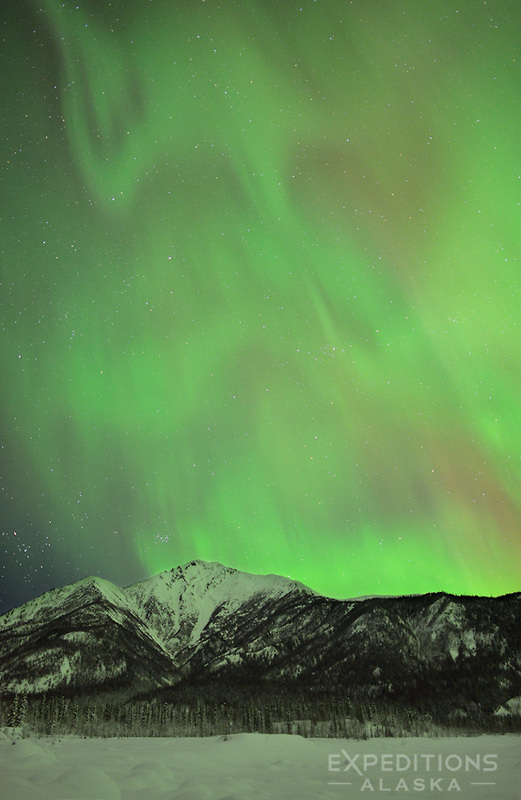 The northern lights soar above the mountains in arctic Alaska. 1) Numbered lists are overdone. 2003 is long, long gone. 2) Write something worthwhile reading, then you don’t need to use stupid click-bait headings to draw an audience. 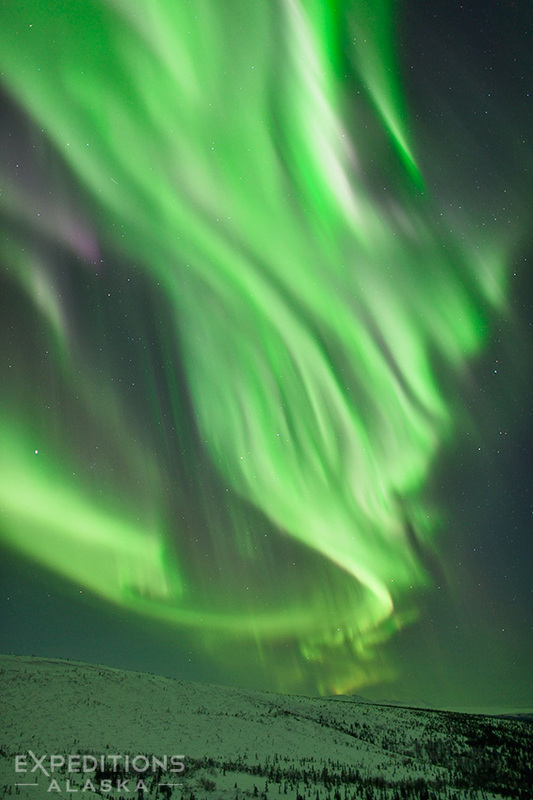 This entry was posted in Alaska, Northern Lights, Photo Tours, Photography, Rants and tagged aurora borealis, Northern Lights on April 5, 2015 by Carl D.
An aerial photo from the St. Elias Mountain Range, converted to B&W in photoshop. 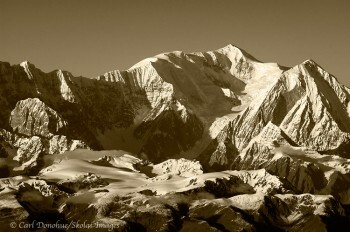 Wrangell – St. Elias National Park and Preserve, Alaska. Please click on the image above to view a larger version of the photo. Someone asked me recently, “What’s a blog?” And after I got over the initial shock and wonder, repeatedly asking myself “is he (yes, he) for real?”, I tried my best to answer. Seriously, what IS a blog? I guess it’s a journal or diary. Or a news outlet. Or a discussion forum. Or about a million other things. Technically, the root of the term comes from the longer word “weblog”, meaning a log, on the web. Log like a record of some kind. But what IS it? For me, it’s a double edged sword; a chore and a hobby. It’s work, sometimes, and sometimes it’s great fun. And sometimes it’s a pain in the a&&; especially when I have nothing of interest to write about, or when my blogging platform, wordpress, causes me no end of headaches and pain and grief as I try to solve some problem I’m having with the site. A site without a dynamic component, like wordpress, can be MUCH easier to handle than a blogging platform. If you folks out there had any idea how much of my life has been wasted as I’ve sat and stared at a screen wondering ‘now why the hell doesn’t it work’, you’d send money. Or drugs. Or money and drugs. Or, well, something. It’s ridiculous. 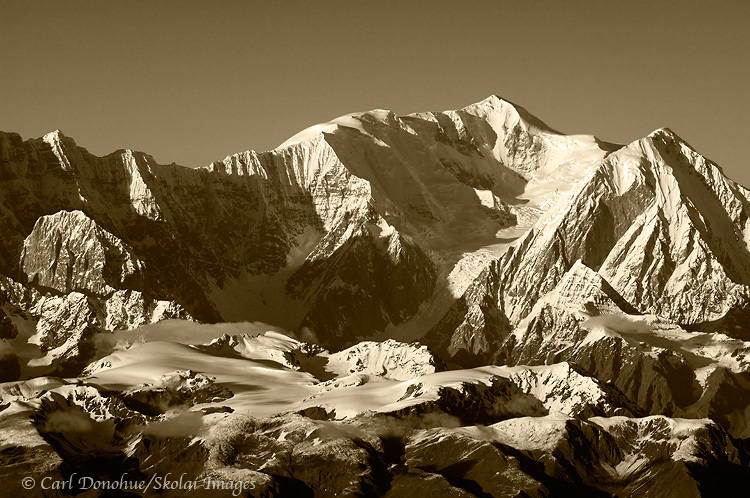 This entry was posted in Aerial Photos, Alaska, Landscapes, Photography, Rants, Social Media, Wrangell - St. Elias National Park and tagged black and white photos, St. Elias Mountains on November 6, 2013 by Staff Writer. 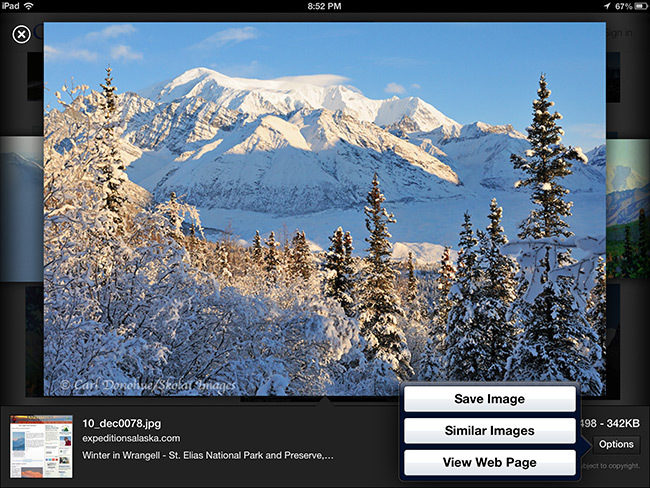 A screenshot of how google images displays photos, hotlinking the original file, with a “Save Image” option. *Update, Nov 13, 2013 – there is now a formal antitrust complaint registered by CEPIC, the Center of the Picture Industry, thousands of photographers and picture agencies, against Google on this matter. See here. So, by now a number of people around the web have commented on the new Google Images display; some even talking about how nice and clean the interface looks. What I haven’t seen is anyone discuss how the Google Mobile App now works. At left is a screenshot from my iPad of how Google Images, using the google app, displays photos on mobile devices. Underneath the image is a tiny thumbnail showing where they’ve extracted this photo from (and where the source file is hosted – in this case, my website). 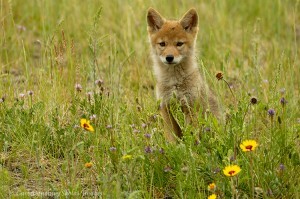 “Save Image”, “Similar Images” and “View Web Page”. That’s right, the very first option is “Save Image” – Google grant you the option to save the full size jpeg right from my website, without you ever having to actually visit my website. 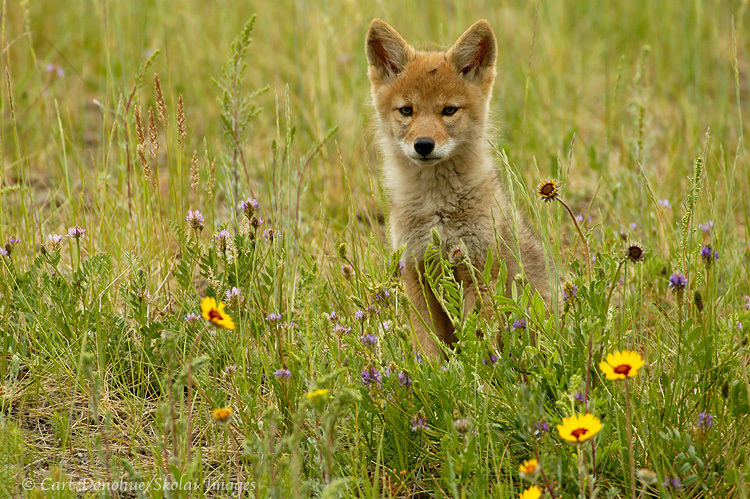 This entry was posted in Alaska, Photo business, Photography, Rants, Web Stuff and tagged google plus on February 4, 2013 by Carl D.
Coyote pup sitting beside yellow daisies, Jasper National Park, Canada. Please click on the image above to view a larger version of this photo. Now, I know what you’re thinking: yes, indeed, the UK Telegraph commenting on any media source of ‘faking’ anything is pretty sad. Let’s disregard tabloid integrity for a moment and consider what this is really about (and what’s WAY more fun); wildlife photography. Wildlife photography does not include zoo and game farm animals; shooting captive subjects, given that some folks are perpetually going to choose to do this, should always be labelled as such, even if only via context (see Darwin Wiggett’s bear photo for an example; and notice that he captioned it regardless). The fact that there are indeed myriad shades of gray, woven through every possible facet of our world, does not make charcoal black any less black. We might differ on where 18% gray is, but we know what black is. 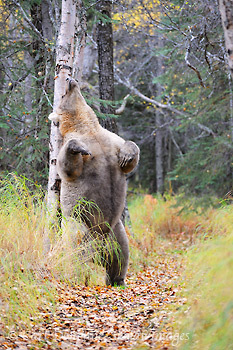 This entry was posted in Jasper National Park, Miscellaneous, Musings, Nature stuff, News, Photo business, Photography, Rants, Wildlife and tagged captive animals, coyotes, Jasper National Park, wildlife photography on December 20, 2011 by Carl D.
Brown bear, Ursus arctos, standing raised upright and rubbing her back against a birch tree in Katmai National Park and Preserve, Alaska. Please click on the image above to view a larger version of this photo. I can’t imagine my father ever calling himself a “professional University lecturer” or my brother referring himself to as a “professional math teacher”. The word professional means many things; but when it’s followed with a vocation, such as “photographer”, it doesn’t mean that you enjoy photography a lot, or that you speak politely about it, or that someone bought a print from you. It doesn’t even mean that you have a website. It doesn’t mean you teach workshops and lead tours, either. Show me a professional photographer, and I’ll wager a dollar I’ll show you someone who’s struggled to pay their rent, who’s sold gear to make their car payment (or sold their car to make their gear payment), someone who’s eaten peanut butter sandwiches because that’s what was available to eat. A professional photographer has made real sacrifice to do what they do (there are always exceptional cases, with trust funds, a wealthy spouse, etc). It’s a risk. It’s giving up an awful lot to choose to pursue a particular vocation. It’s losing on that risk, picking up, and swinging the stick again. And again. And yet again. Repeat, infinitum. It sounds much more glamorous than it might be. It means you take the bus sometimes, it means you sit in the rain and wish you were somewhere else. It means you sometimes take a lower price for a sale because you need shoes. Pardon my French, but it means you’ve been sh** on. It means you’ve wished, cursed and swore that you had chosen some other manner to live by. It means you say ‘yes’ when you think ‘oh sh**, that gig sounds like hell’. It means you say ‘yes’ and then that gig actually IS hell. And you then say ‘yes’ again. Still you pursue it. This entry was posted in Alaska, Art, Katmai National Park, Musings, Photo business, Photography, Rants and tagged Grizzly Bears, Wildlife on December 13, 2011 by Carl D.
View up Arrigetch Creek toward the Arrigetch Peaks, Xanadu, Ariel and Caliban, from left to right. 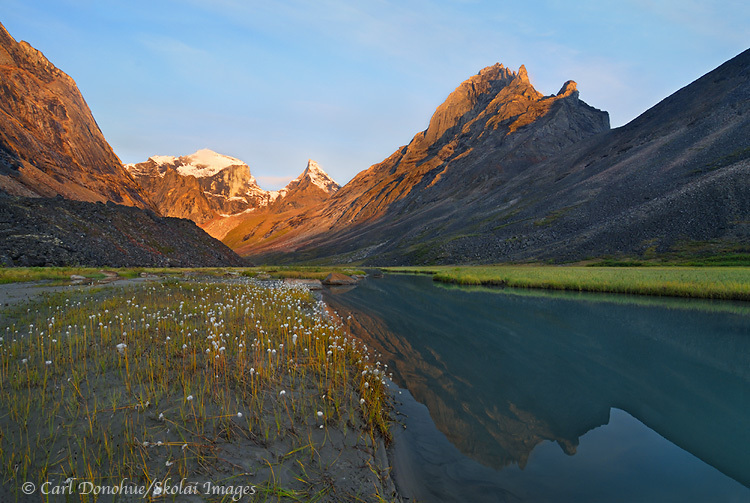 A popular rock climbing and backpacking destination, the Arrigecth Peaks lie in the heart of Alaska's Gates of the Arctic National Park and Preserve, right near the Continental Divide. Arrigetch Peaks, Gates of the Arctic National Park, Alaska. Please click on the image above to view a larger version of this photo. You perhaps saw this recent story in the news about our ‘drowning in a sea of images’. It’s an interesting view, and, I believe, a very valid point. Any kind of inundation makes staying afloat a difficult task. And sometimes it’s impossible. A photographer and artist I admire, Chase Jarvis, recently posted a response to this on his blog, about how we’re not drowning, but getting richer with this unabating torrent of images. That’s kind of a weird take on it. What kind of flood can we swim through? This entry was posted in Adventures, Alaska, Backpacking and Hiking, Gates of the Arctic National Park, Landscapes, News, Photography, Rants and tagged Arrigetch Peaks, Gates of the Arctic National Park, Landscapes, scenics on November 23, 2011 by Carl D.
Just spreading the word here: You’re all familiar with GoDaddy hosting service. The CEO, Bob Parsons has posted a video of himself on vacation to Zimbabwe, where he, gets this … shoots a bull elephant. The video is presented here. The guise that this is “saving people’s crops” is simply ridiculous; I suppose next he’ll save by handing out free GoDaddy caps to villagers he not only fed, but clothed, the villagers. If you host your site with GD, I hope you’ll take steps to move it elsewhere. I certainly would. There’s no way I’d want any of my money going to fund this idiot’s business. Photographer Jim Goldstein has a blog on this topic, as well; and full props to him for getting the word out there on a subject like this. HIs blog is here. 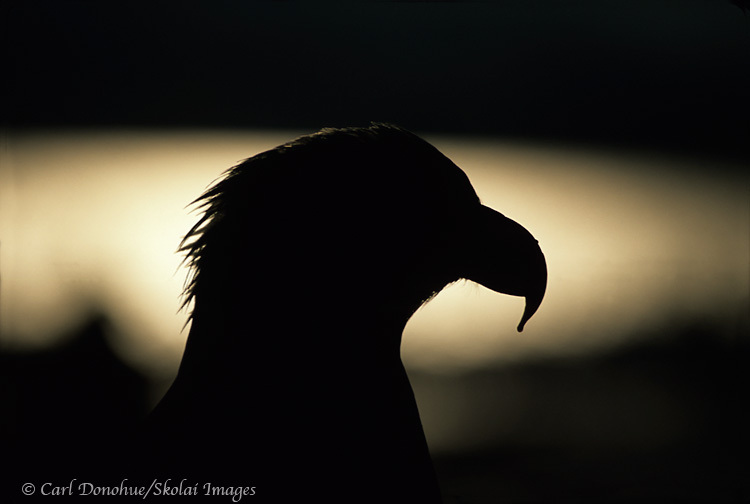 This entry was posted in Environmental Issues, News, Rants and tagged conservation, Godaddy on April 1, 2011 by Carl D.
An adult Bald Eagle silhouetted headshot, on perch, Homer, Alaska. 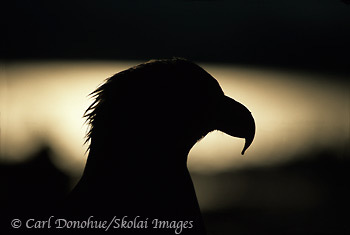 (Haliaeetus leucocephalus). This photo was taken with photo equipment, by a photographer. The 2 worked together. The eagle co-operated only briefly. Pesky eagles. Click on the image above to view a larger version of this photo. I read it again last night. This nonsense has to stop. Why do photographers so often have such a hard time simply acknowledging that what we do is inherently technological? As such, technological advances (i.e., new gear) can (and typically do) play an enormous role in the work we produce. Perhaps much more so than most other art forms. You’ve all seen the kind of commentary I’m talking about; another piece about how painters don’t talk endlessly about their paintbrushes. Or, even more inanely, how if Art Wolfe were to shoot with a P&S camera, he’d still produce a remarkable portfolio. It’s the photographer, not the camera, that produces great work, blah, blah, blay. This entry was posted in Abstract Photos, Alaska, Art, Birds, Musings, News, Photography, Rants, Tech Stuff, Wildlife, Wrangell - St. Elias National Park and tagged Art Wolfe, Bald eagles, Birds, photographers on March 16, 2011 by Carl D.
Black and white photo of Great Egret, St. Augustine, Florida. “The word photography is based on the Greek φῶς(photos) “light” and γραφή (graphé) “representation by means of lines” or “drawing”, together meaning “drawing with light” (ya gotta love Wikipedia). “Photography means painting/drawing with light”. It’s time photographers (and photography) mature, and walk away from this virtually meaningless phrase. The phrase is a fabrication, deception at best, and has never been valid. Let it rot. We’re not painters, we’re photographers. We no more “draw with light” than does any person with their finger in the sand. Pixels and film aren’t light, they don’t even “capture” light, they merely represent it – to propose otherwise suggests only a childlike understanding of what light might actually be. If interpreted in this callow manner, all painting would similarly be “painting with light”. Indeed, all visual art could be a form of painting with light; drawing with pencils and crayons, digital graphic arts, sculpture, pottery, dance, et al. Van Gogh painted with light. Michaelangelo painted with light. Early aboriginal cave paintings were painted with light; with no light, there’d be no painting. Most certainly, there would be no viewing these paintings. The idea that we paint with light is no more valid than saying carpenters sculpt houses with stardust. 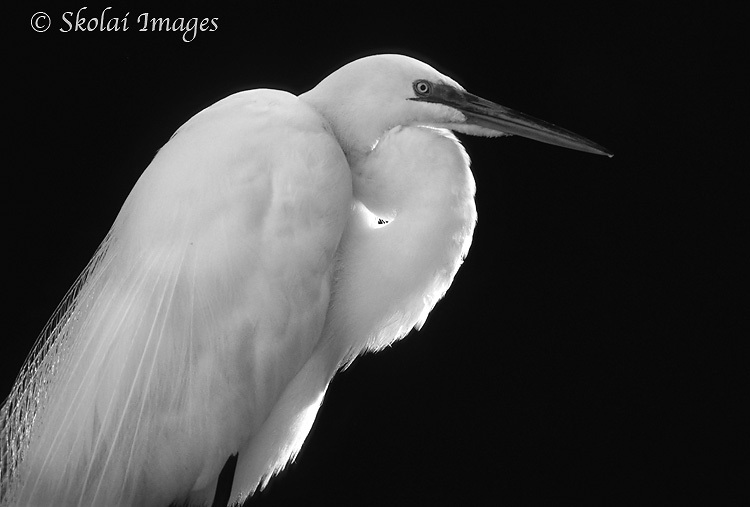 This entry was posted in Art, Birds, Musings, Photography, Rants and tagged Art, Birds, Florida, Great Egret, Photography on February 14, 2011 by Carl D.